Set in Azerbaijan in 1937 and based upon Elchin’s play, Midnight tackles life under Stalin’s terrifying rule where a midnight knock on the door could be followed by trumped up charges of counter-revolutionary activity, torture and in all probability, death. 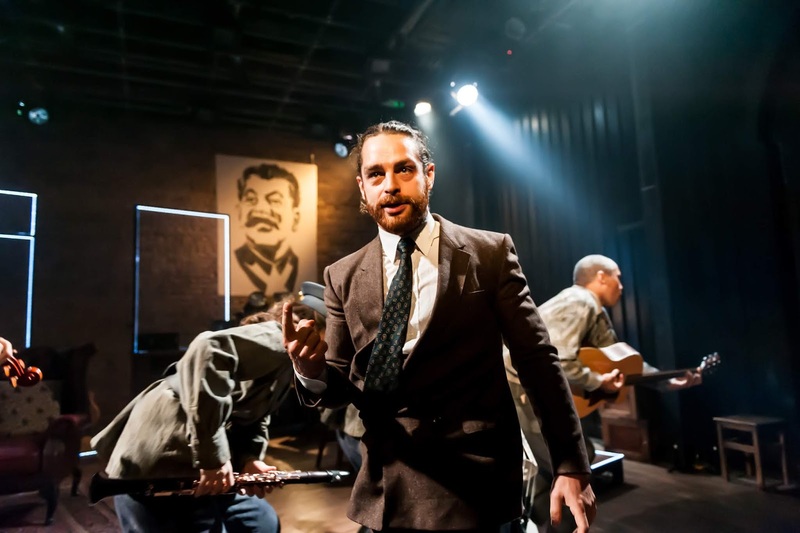 For musical theatre this is an ambitious subject to grapple with and a show seeking to compress Stalin’s grip on the Soviet Union into one small Baku flat on a New Year’s Eve some eighty years ago, needs some sensational songs and narrative if it’s going to pack a punch. Unfortunately, it’s punches-pulled here, although Midnight does prove to be an evening of two halves. A bunch of (for the most part, talented) actor musos lead a first half that either needs a massive trim or a re-write, before the show comes alive in act two with twists and revelations that mingle Faust with Kafka. The tale is one of those that to even hint at would spoil, suffice to say that combining horror and the supernatural with totalitarian politics makes for an excellent second half cocktail. Whilst some of the melodies are magical, (Let Yourself Go and The Colonel in particular) there is too much mawkish balladry sprinkled throughout with the first act’s closing number, The Great Machine, feeling contrived and lacking the devastation that should send the audience reeling into the theatre bar for half-time revival. But within this curious piece, there are some gems. Leon Scott as the Visitor/Officer has a captivating presence that demands our attention in every scene. Perfect in voice and poise, it is Scott’s energy at the heart of this machine. And in a tiny role amongst the musical ensemble Melania Maggiore (who based upon her bio in the programme appears to be making her first UK performance in this show) delivers an absolutely exquisite soprano performance singing Let Me Sleep, matched only by her enchanting work on the violin. Kate Golledge uses the space imaginatively, with Chris Cuming’s choreography being worthy of its Offies nomination and a rare shout out for a show’s fight director, Jonathan Holby, who with minimal use of props and make up, convinces us of appalling violence. The People vs an all-powerful and unfair State has long been the source of good musical theatre (Les Mis anyone?) but this show’s emotional reach rarely ventures out of the shallow waters other than perhaps reminding us of the perils of far-left socialism. There’s something special around Midnight, but it needs more work.